Finally, a solid-state drive arrives that can capitalize on the theoretical advantages solid-state memory offers over hard disk drives. Intel isn't new to SSD, but it is looking to reinvent the rule book with its latest--and most mainstream--entry in the market, first announced at August's Intel Developer's Forum. The Intel X18-M and X25-M drives are shipping this month, and are designed to fit 1.8-inch or 2.5-inch SATA hard drive bays, respectively. Both lines come in 80GB and 160GB versions. The drives use multilevel cell (MLC) flash technology, and feature complex wear-leveling algorithms to handle the write stresses placed on drive technology. The biggest news, though, lies in the performance of Intel's new SSD line. In the PC World Test Center's evaluation of an engineering sample, the X-25M dramatically outperformed both a 4200-rpm hard drive and another SSD drive from Ridata. Compared with a 4200-rpm Toshiba MK2035GS hard drive, the Intel 80GB X-25M SSD showed big gains across all but one of our slate of seven tests. Disk-intensive tasks generally showed improvements. It most cases, the results were dramatic: For example, to copy 3.06GB of files and folders, the Intel drive required just 63 seconds to complete the job; the Toshiba drive took four times as long--256 seconds--to perform the same task. The 128GB Ridata NSSD-S25 drive fell somewhere in between, taking 177 seconds. On our Nero disc imaging test (a subset of WorldBench 6), the Intel drive required 266 seconds, to the Ridata's 476 seconds and the Toshiba's 847 seconds. On two of our tests, the Intel drive was closer to the other drives we'd tested. The Intel took 323 seconds to scan our test machine's 3.2GB folder; the Ridata was a smidge slower, at 329 seconds; the Toshiba was way behind at 564 seconds. On another test, creating compressed files using WinZip, the Intel drive require 252 seconds, while the Toshiba required 272 seconds. To understand why Intel's SSD has the potential to deliver improved performance over previous company's attempts at SSD, you first have to understand how data is written to flash storage. The SSD's controller manages both the flash memory and the data flow to and from the host. To write 1GB of data, competing SSDs need to write 20 to 40 times that amount of data to actually complete the 1GB write. Data gets written in blocks into both DRAM and the flash memory, and by the time you're done with one operation, you've actually written, in a common example, 32GB of data to change 1GB of data. And the complex process bogs down the movement of data through the SATA II bus controller, too. 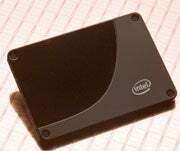 With its new SSDs, Intel has changed the write strategy by introducing its write amplification technology. Write amplification is defined as the amount of NAND flash writes performed for a requested amount of data writes from the host computer. Instead of requiring 32 times the write cycles, as in the example above, the multiplier is now only 1.1 (or slightly less, according to Intel)--and the amount of overhead has been dramatically decreased, too. Intel rates its drives for five years of useful life, assuming up to 20GB of data written each day. The company also rates its drives for 1.2 million hours mean time between failure--a spec that hard drive companies typically release only for their enterprise-class drives (Intel's spec is competitive with enterprise-class hard drives). Solid-state drives have been touted as the future of storage. But the initial SSD models shipped last year were highly disappointing: They cost hundreds of dollars more than a traditional hard drive, for lower capacity, and little tangible improvement. In the PC World Test Center's evaluation last year of models from SanDisk and Samsung, we saw only moderate improvements on some disk-intensive tasks. This year, SSD evolution had remained incremental, until now. More and more players are entering this space. Intel's release certainly livens things up, and makes SSD potentially far more interesting for both consumers and enterprises alike--especially given the potential power savings SSD drives can offer. The power savings may end up being less of an issue for consumers than for businesses, though. A notebook's hard drive represents one small part of a notebook's operation, while an enterprise's 24/7 data center could see long-term benefits from using storage that offers lower power consumption. The PC World Test Center continues to examine the power consumption of these drives; we'll update this story with more information.